Recently the first PDC Unicorn Women's World Championship was played. Unicorn was the main sponsor of the tournament but it was not the first time Unicorn was involved in such an enterprise. Years ago Unicorn already once was the main sponsor of another tournament, as well a World Championship. This tournament set up new standards and one probably can say it was the starting point of the "modern" tournament. The tournament even was televised on ITV. It is not really known why it took place only twice. 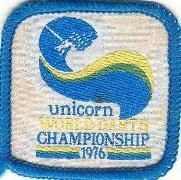 Organised were the two Unicorn World Championships in 1975 and 1976 by the newly founded BDO and the main sponsor Unicorn, a cooperation one hardly can image now-a-days. 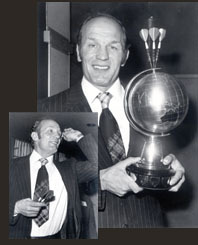 Beside Olly Croft and the then Unicorn director Stanley Lowy it is liekely that Barry Twomlow, the ambassador of darts and the American Tom Fleetwood were the driving people both behind the tournament and in founding the WDF. The tournament was played in London and it was a men's pairs tournament. Players from 16 countries took part though the participants were not identical with the founder members of the WDF. Both, Germany and Switzerland, took part in the tournament but were no WDF founder members while New Zealand didn't participate in the tournament but sent some officials to take part in the founding of the WDF. In some of the participating countries at this time no national organisations did exist and no national championships. In those countries it were the dart suppliers, probably Unicorn dealers, who organised small qualification tournaments and sent the winners to London. It looks it was rather difficult in Canada and no one really wanted to support the venture. In a newspaper article of the Ottawa Citizen from 1975 it's reported indignantly that though darts was already quite popular in Canada the Canadian participants had to play their qualification in New York by invitation of Sportscraft and that Sportscraft even payed the costs for travel to and accommodation in London as no one in Canada came forward to take over. Sportscraft at that time was the American sole agency for Unicorn and played an important role in the American sport of darts from the 1970s to the 1990s. The World Championship both times took place in the West Central Hotel in London over two days. On Saturday the qualifications for the participants from England, Scotland, Wales and Ireland were played while the real World Championship then was played on Sunday. Around 40 different British regions had already played out a winner some time before the World Championship and the regional winners now played out an English, Scottish, Welsh and Irish Champion. Reaching the regional final had already won the players some price money and travel to London and accommodation there was paid by Unicorn. On Saturday evening an evening program was took place for the players, the families, guests and officials, a cabaret evening with well-known artists of those years. The real World Championship was played - as the Ottawa Citizen tells us - in front of around 3000 spectators, probably the venue was squeezed. The format of the matches was three legs of 601, two single legs and one double leg and in 1975 Ken Brown, English national player and English champion, played a world record leg - a 14-darter with scores of 180, 140, 125, 100 and 56. In 1975 the winners were the Welsh pair Dave Jones and Ray Phillips (picture), 1976 the winner came from Australia: Kevin White and George Foster. Both time the winning double got 2000 pounds price money. In 1975 John Lowe was one of the two English participants. Beside him one can't find still well-known names between the participants and it's almost impossible to find out what happened to them. Gibraltar in both years was represented between others by Joe Goldwin, the founder of the Gibraltar Darts Organisation. One of the founder members of the Canadian Darts Organisation - Robert Dupuis - in 1976 stood at the Oche. It looks Bob Dupuis is still around in darts and quite successful in senior tournaments. In Autumn 2009 he stood as Officer McNealy in a play on stage - as the program mentioned it was his first ever stage appearance since the Unicorn World Championship! The American Jack Curry owned till a few years ago a dart pub in San Mateo, California - the "Prince of Wales" pub. He had to sell it but still plays darts as does his partner in 1976 Russ Zanardi, who still plays in the Peninsula Darts Organisation in California and who seems to be a difficult person. Bert Berg, one of the two Swedish participants in 1976, played after the World Championship a few years in the famous Swedish Old Bowler Club which was already founded in 1965. In 1981 and 1982 he could win the club championship as did Pär Riihönen, who now plays the PDC Pro Tour, in 2000. One of the Danes, Flemming Hansen, is mentioned in 2008 as director of the Dart club in Hvidovre. Omer Bauwsen from Belgium was several times Belgian Champion and in 1984 reached the final of the Dutch Open. A little bit more is known about the two Australian players Kevin White and George Foster, who both took part in 1975 and 1976 and who were the winners in 1976. Kevin White played darts since 1970 and in 1976 and 1982 he reached the semi-finals of the World Masters. 1981 and 1983 he took part in the BDO World Championship. 1983 he won together with Barry Twomlow the Royal Hawaiian Men's Doubles Championship and in 2005 he appeared as participant of the New Zealand Open. Kevin White together with Bobby George and Jocky Wilson was involved in the recording of the original One Hundred And Eighty Song. Thanks to Patrick Chaplin, the Doctor of Darts, one knows a few more bits and pieces about George Foster whom he met in 2009 in England. George Foster is no native Australian, he was borne in England and played there for Cheshire. 1964 he won the Cheshire divisional finals for the News of the World Championship. During the same year he emigrated to Australia, worked there as tool maker and hotel manager and still played darts, this time for Australia, and took part for Australia at the Unicorn World Championship and other tournaments for example the Australasian Dart Championship. After some years he moved on to Papua New Guinea and played for this country as well. In the 1980s he returned for a few years to England and really managed to win in 1984 again the divisional finals of the News of the World Championship. Today he is back in Australia where he is known as Mr. Wonderful but in 1997 he stopped to play darts. Pictures with courtesy of Unicorn.